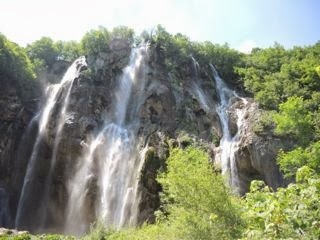 A few years ago I read about Plitvice Lakes National Park and saw a Rick Steves' travel show about it. 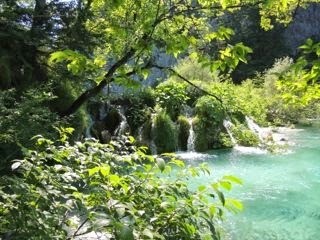 I was surprised that I had never heard of it, but decided if I was ever in Croatia I would visit the park. When traveling with teenagers you don't get the earliest start, which is unfortunate because the park was a four hour drive from the Hotel Vista. Still we were determined to give it a go. 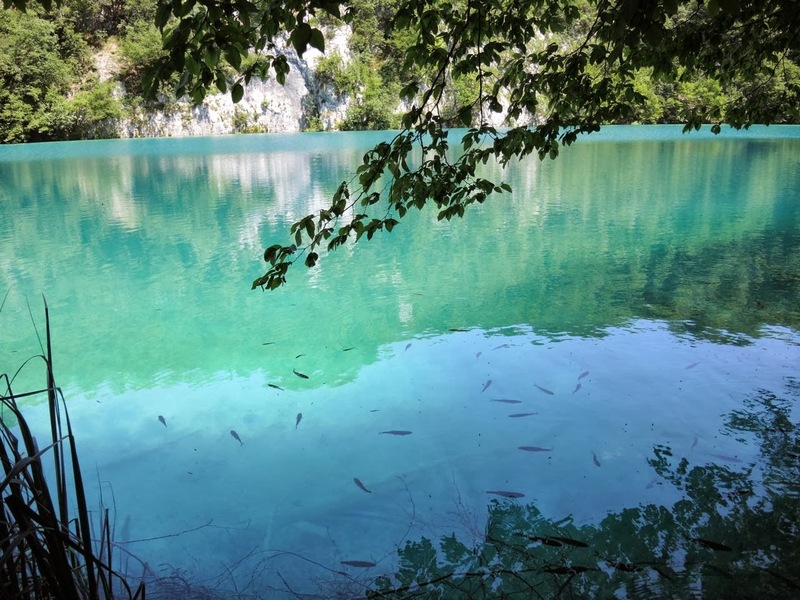 Two of the hotel staff members had recently visited the park and told us it was definitely worth the effort for its extraordinary beauty. They recommended we take a direct route to get there and return by the more scenic route along the rocky, Croatian coast. After our little jaunt into Slovenia that had us lost on our way to Croatia, Addison made sure to check all our driving directions on his computer before we went any where. We were almost flawless getting to and from the park except for the last two kilometers. 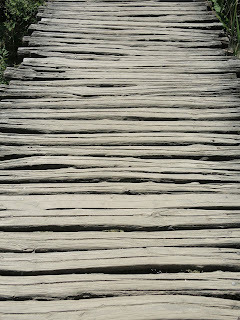 We seemed to lose our bearings right at the end, so I asked a father and daughter for directions. 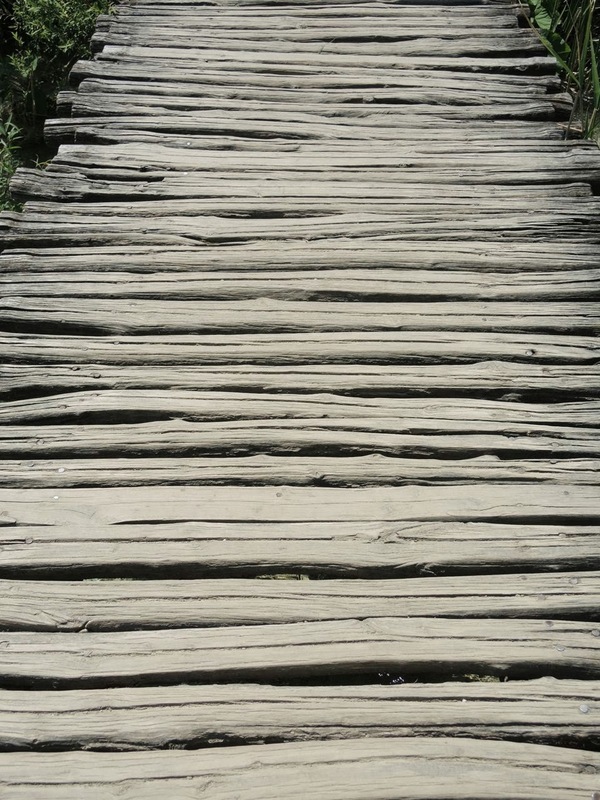 The daughter told us we were very close She said to cross a nearby wooden bridge and the park was just beyond on the other side. Don't be scared she added. 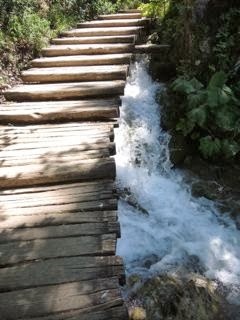 Very slowly I drove our rental car across the rickety structure and prayed we would not end up in the water below. 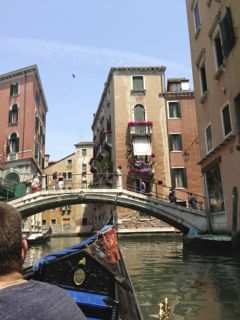 Thankfully, the bridge held and a few minutes later we were purchasing tickets to tour the park. 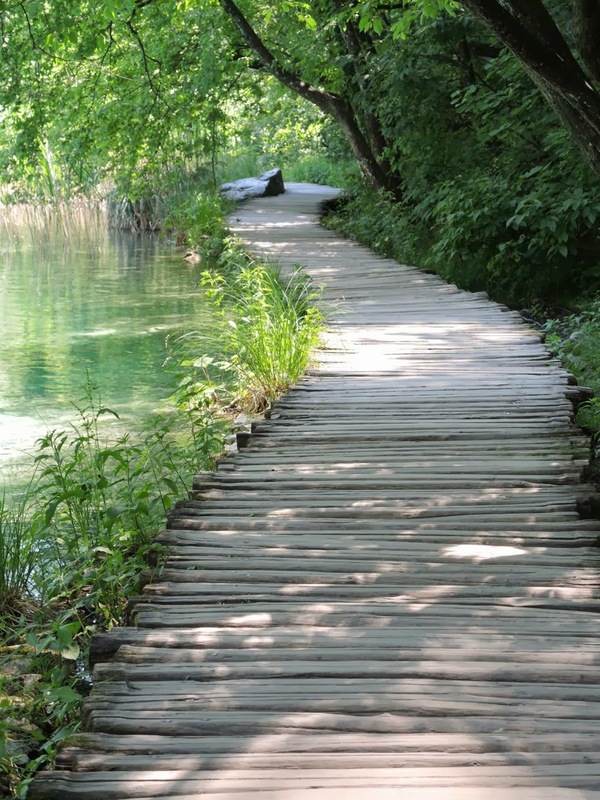 Plitvice Lakes National Park is full of waterfalls and pristine lakes with miles of trails winding through lush forests. The views are stunning. 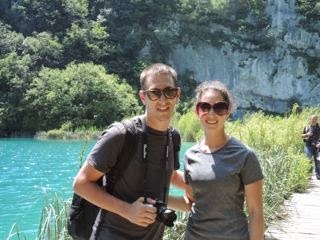 We spent five hours hiking from one end of the park to the other with a boat ride in between. We were hot, tired, and hungry when we finished, but we had seen some of the most spectacular scenery we have ever experienced. 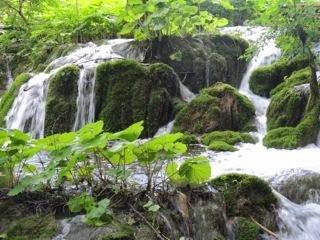 I have included Rick Steves' video of the park at the end. His words are much better than mine at describing the park. I did not make a video of our experience, but I did take lots and lots of photos. These are some of my favorite. Rick Steves' Plitvice Lakes National Park video. 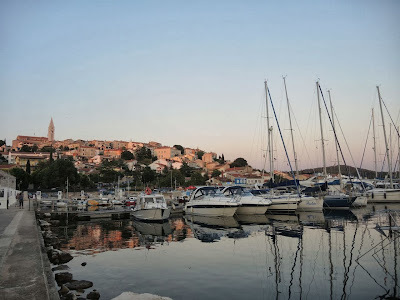 It was dark when we arrived at Hotel Vista in Croatia. The staff asked if we had missed their country and in fact we had. We should have arrived several hours earlier, if not for a wrong turn. 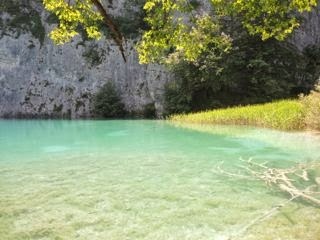 Instead of being in Slovenia for a few kilometers we had gone deep into the country. 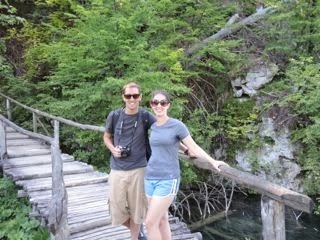 Slovenia is beautiful, but it was just not where we were going. Maddie had begged me to get a GPS for the rental car, but I felt confident that the maps I had printed from the Internet would be sufficient. 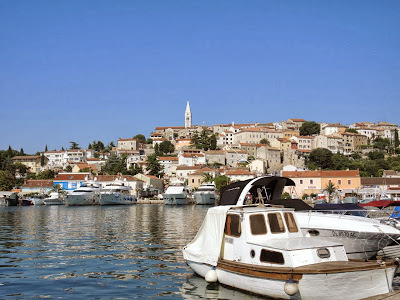 We just needed to follow the coast from Venice to Vrsar. It did not look too difficult. 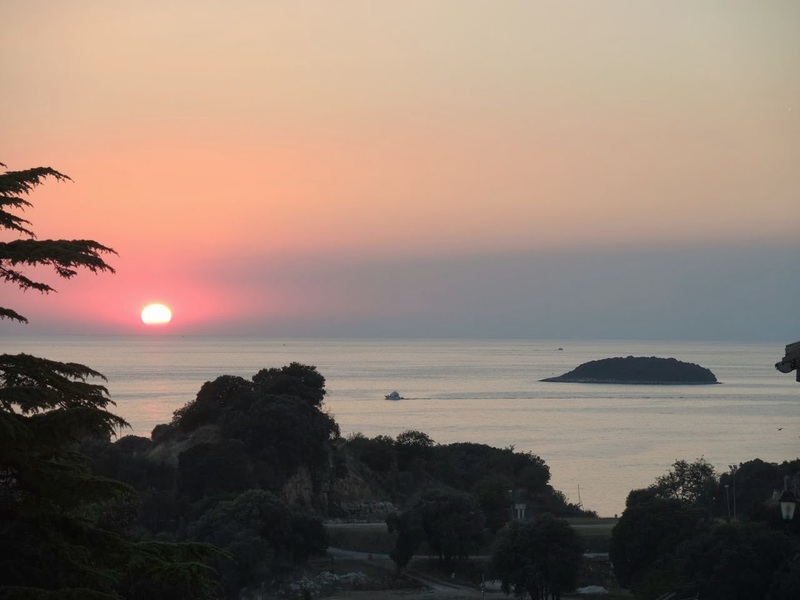 The first clue that we had gone awry was when I noticed the sun was on the wrong side of us. When we passed a sign for snow skiing I stopped to ask for directions. Sometimes when you make a mistake it is a good thing as the kind man at the hotel desk told us. Wait until tomorrow, you will see. 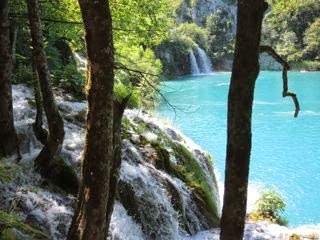 You are in Croatia now, you can relax. 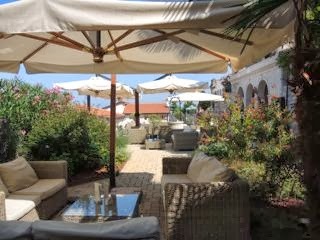 In the morning when we went to breakfast Maddie filled her plate and went to go sit on the terrace. A moment later she came to get me. Mom come here, she said rather urgently. The view above is what we saw. The three of us stood staring at the intense blue water and took a long, deep breath. We could indeed relax. If we had arrived before dark we would not have had such a lovely surprise. Being lost is okay, but we would try not to repeat it... too often. High on a hill, near the church steeple in the photo below Hotel Vista is nestled between a quiet street and the hill above. 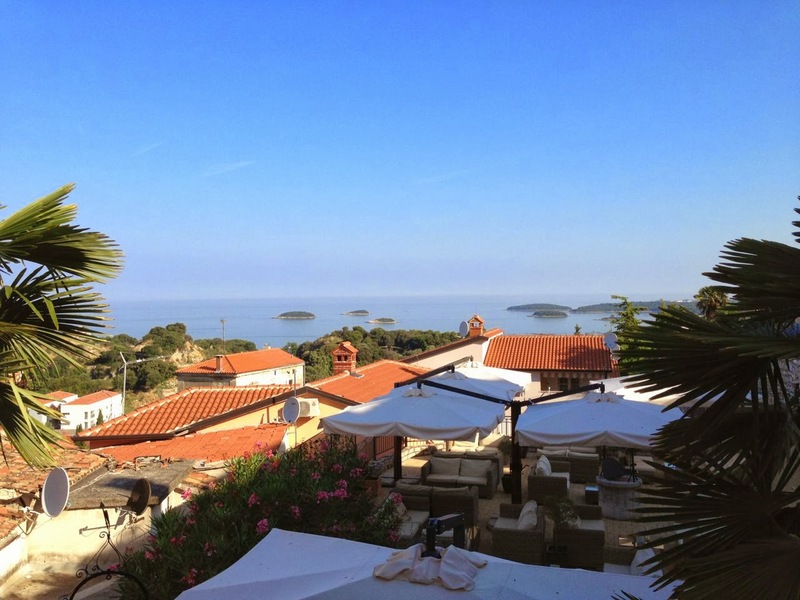 It is a lovely inn with a gracious staff and spectacular views. 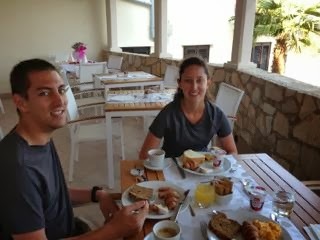 We enjoyed the absolute best breakfasts of our entire trip each morning on their secluded terrace. Homemade pastries, cakes, and breads, fresh fruit, grilled vegetables, meats, cheeses, and eggs just about anything you could want to eat was artfully arranged to please the palette as well as the eye. The happy, helpful staff made us feel as if we were guests in their own home. 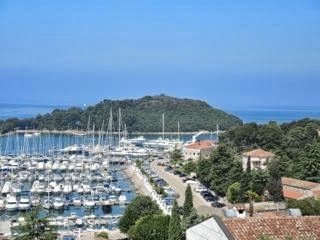 The terrace runs the length of the hotel creating an inviting space to relax and enjoy the beautiful views of the water and the marina. 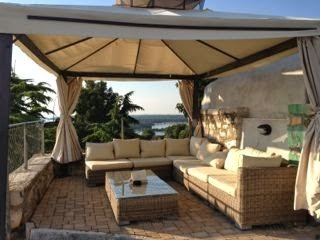 Chaise lounges lead to the welcoming cabana below. It is a lovely place to sit and gaze at the water. I don't know what it is about water that is so calming, but I can just feel myself relax when I'm around it. 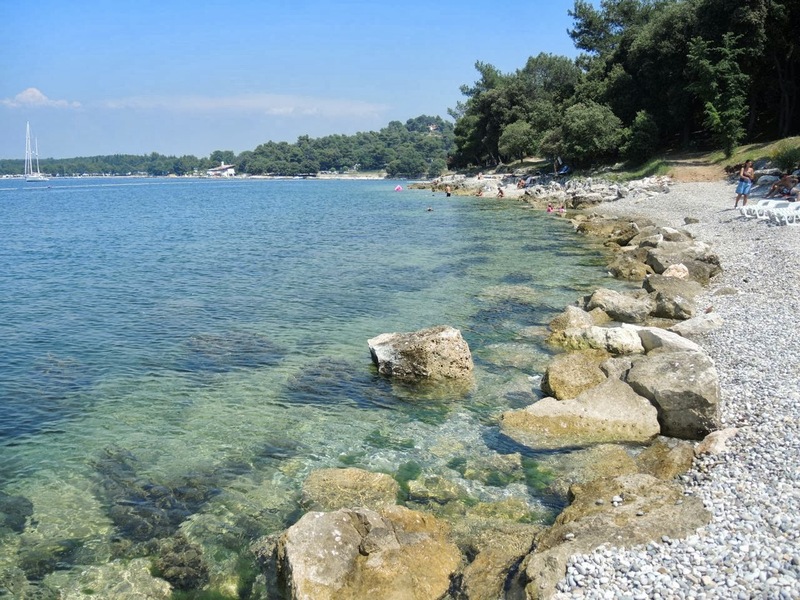 A short walk down the hill leads to a rocky beach where sailboats lazily dot the horizon. We would visit the local bakery for a picnic lunch to enjoy after swimming and lounging on the beach. 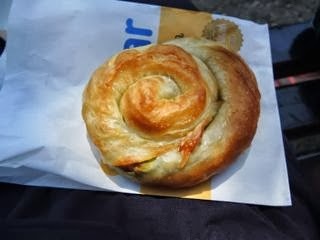 I fell in love with a spinach and cheese-filled pastry. The sales person tried to teach me how to pronounce it, but my mouth would not wrap around the words. It is a difficult language for sure. I don't remember what the pastry was called, but it was delicious. 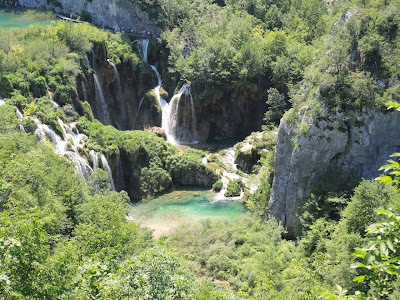 We added Croatia to our European itinerary because Maddie wanted to go some place different. 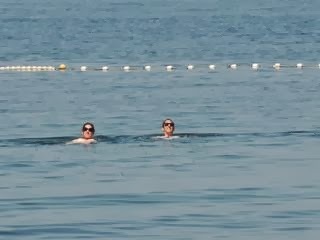 Addison and I were game because we love water. 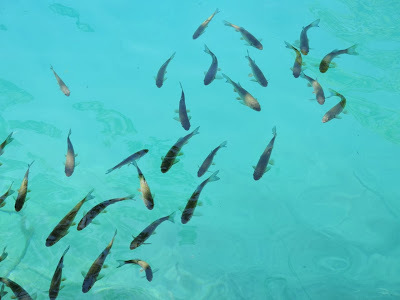 One of the many benefits of miles/kilometers and miles/kilometers of coastline is the extremely fresh seafood which we took advantage of as much as possible. While the Internet is a great tool for finding good places to eat never underestimate the value of the hotel staff to steer you in the right direction when you are hungry. 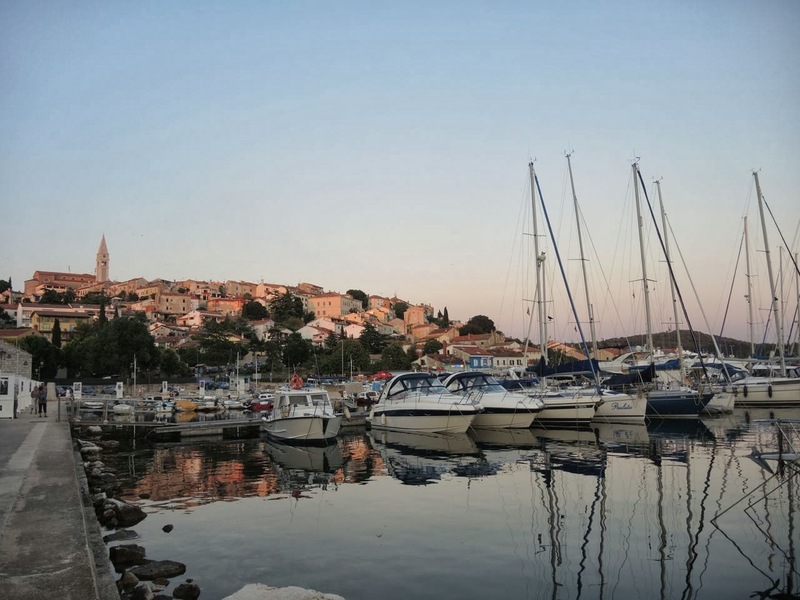 Dining on the terrace of Trost which overlooks the Vrsar marina is a real treat. The view is pretty. The waiters are charming and the seafood has just come off the boat. 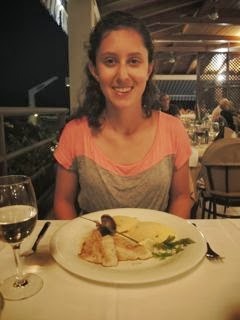 Maddie had sea bass in lemon sauce with polenta. 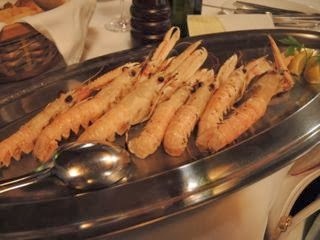 I had grilled scampi, that was tender, sweet and smoky. I would rather my food not look at me, but these little guys were so succulent I didn't mind. Addison had grilled scampi with pasta. 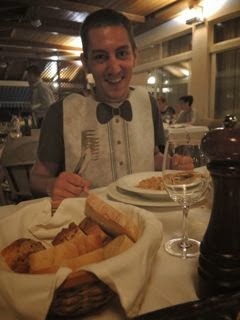 The waiter presented him with a tuxedo bib to spare his shirt which he wore with great humor. When it was time to leave Croatia Addison and I walked down the hill a short distance to get the car. Maddie stayed with the luggage at the Hotel Vista. We had to make a loop to get back up to the hotel. It took a little longer than it should have, as I got a bit lost. Thankfully, there were several signs leading us to the hotel to help us find our way. As Maddie patiently waited with the hotel staff they joked that perhaps I should get a GPS - a GOOD GPS - next time... Perhaps, but it is not so bad being lost in Croatia. In fact, I look forward to the next time that I am. I live in a four season climate and each season holds something special for me. Well before the fall foliage begins its colorful display I will notice the summer light has changed from high and bright to long and golden as summer gives way to autumn. I love summer for its warm weather, long days, and bountiful produce like corn, berries, peaches, and tomatoes. But as summer fades and the nights begin to have a chill I start to long for autumn, sweater weather, and soup. My mother-in-law generously shares her garden's bounty with me. 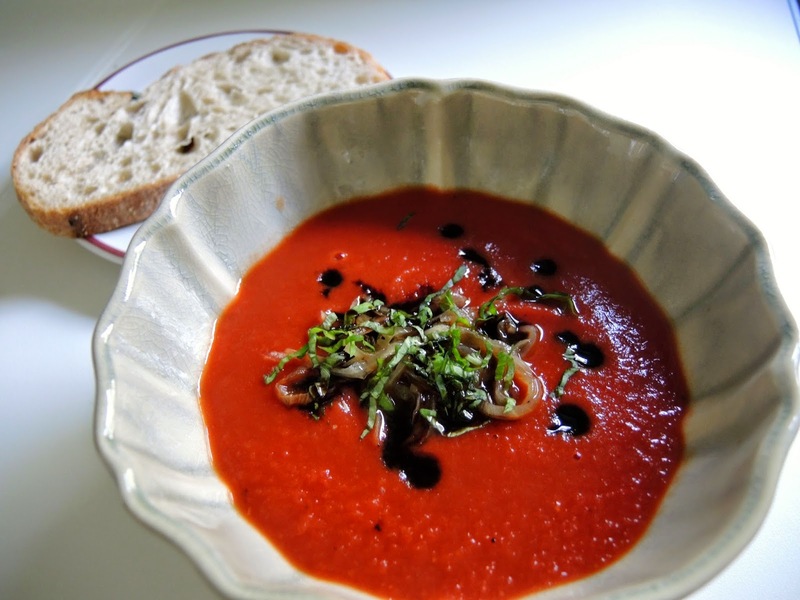 I turned these beautiful end-of-season tomatoes into a satisfying soup. The basil infused, condensed balsamic vinegar adds a punch of tart, sweet flavor. I keep a jar of the drizzle in the back of my refrigerator to sprinkle on just about everything from goat's cheese, salad, and meat, to fruit. In fact, I haven't found anything that I don't like it on. Do use an exhaust fan while reducing the vinegar as the smell can be a bit overwhelming. 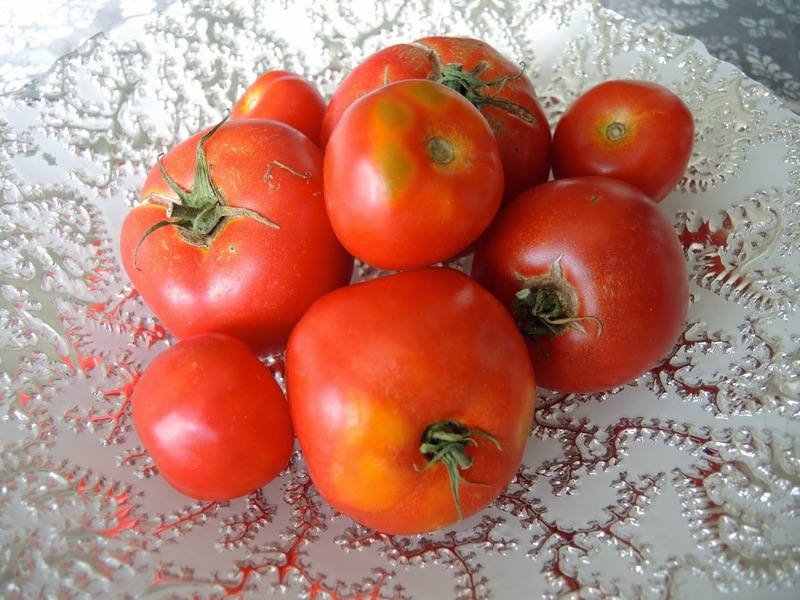 Sprinkle tomatoes with olive oil, salt, and pepper. 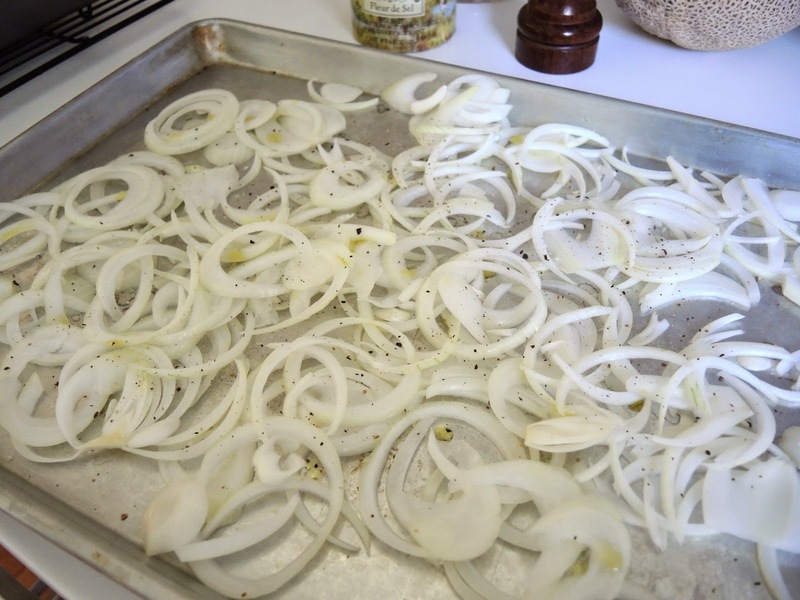 Toss thinly sliced onions and garlic cloves with olive oil. Roast in oven with tomatoes until brown and juicy. Keep a close eye so nothing burns. 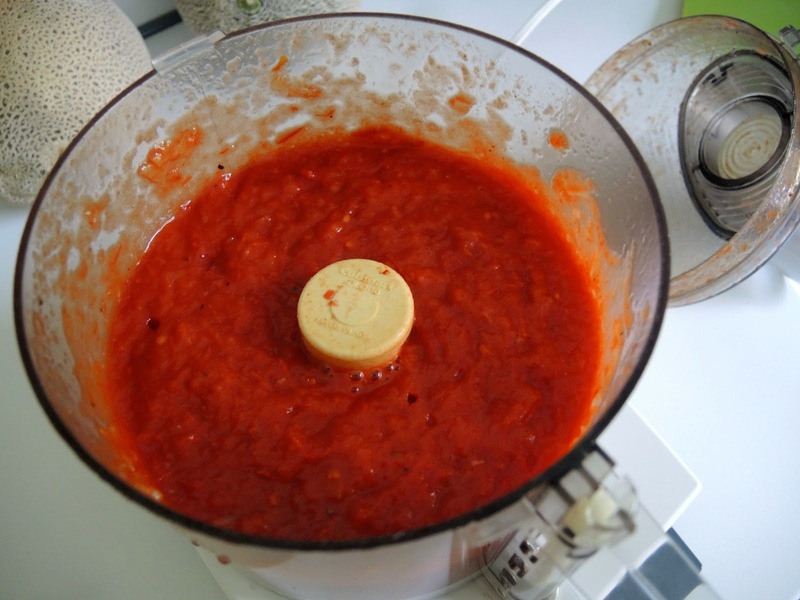 Put tomatoes, onions, and garlic in a food processor or blender making sure to get all the juices from the pan. Purée until smooth. ... resulting in a smooth, creamy soup. 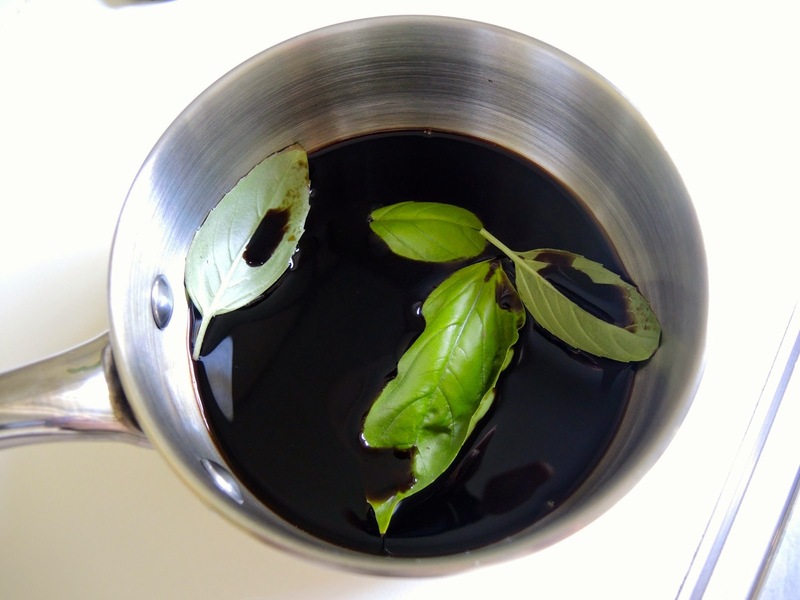 Simmer balsamic vinegar with basil until reduced to a third of the original amount. Store in a glass jar in the refrigerator. It will keep for much longer that you will probably have it since it is delicious on just about everything. Preheat oven to 350℉ (175℃). 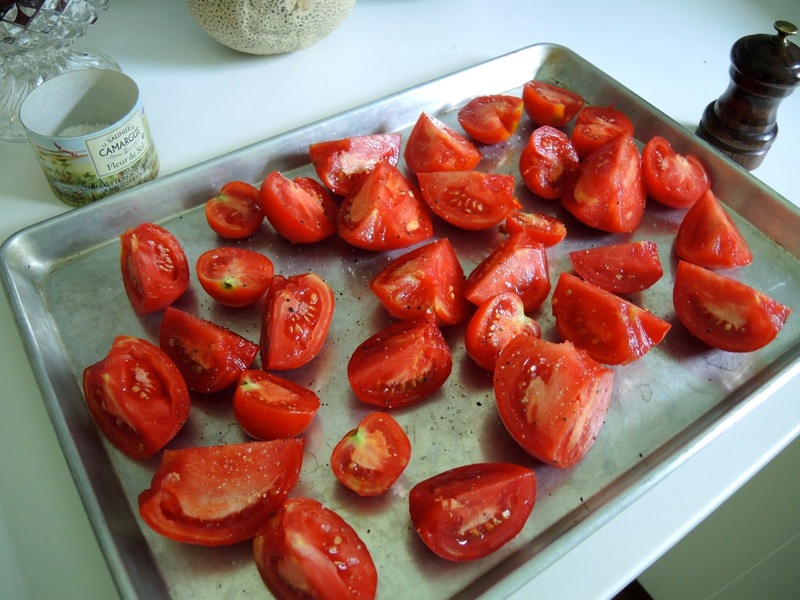 Core and quarter tomatoes spread on a baking sheet and toss with one tablespoon of olive oil. Thinly slice onions spread on another baking sheet, add peeled garlic cloves and toss with the other tablespoon of olive oil. 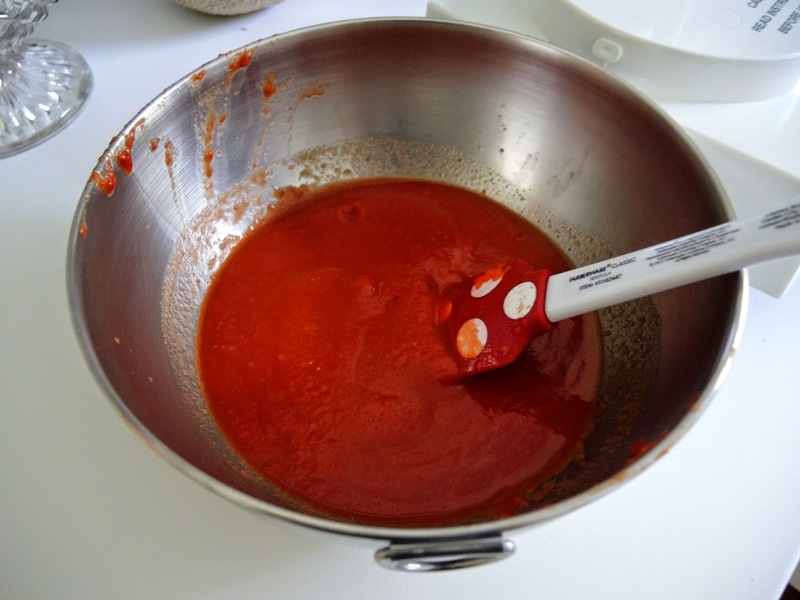 Sprinkle tomatoes, onions, and garlic with salt and freshly ground pepper. 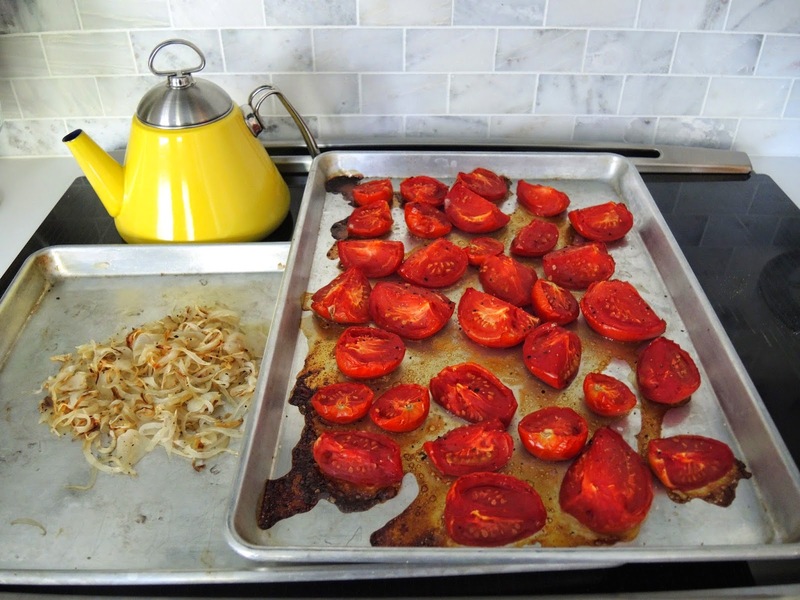 Roast until tomatoes and onions are soft and starting to brown from 30-40 minutes. Rotate pans and stir onions, so they don't burn. Cool on pans for 10 minutes. Reserve a little bit of the roasted onion to garnish soup if desired. Set aside. 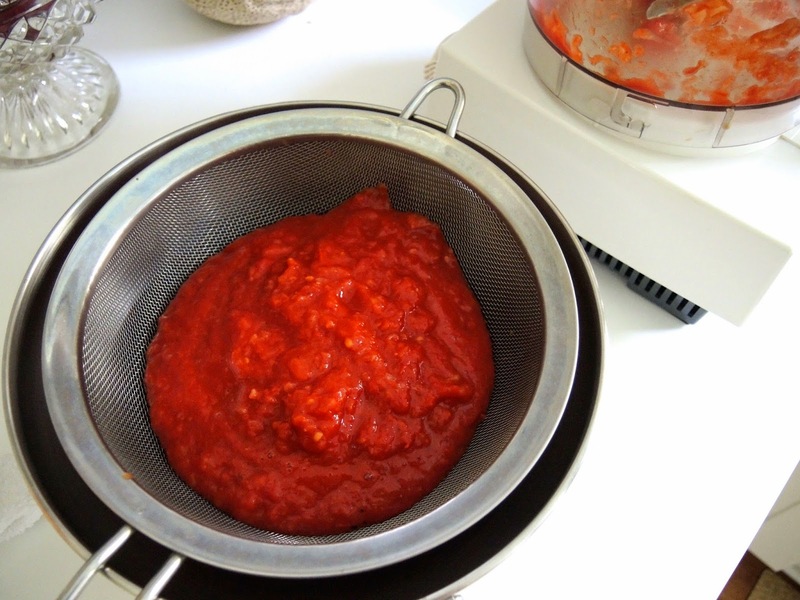 Scrap tomatoes and their juices with the rest of the onions and garlic into a food processor or blender and process until smooth. Put mixture through a sieve into a pan. Add water or chicken stock and sugar. Simmer on the stove 10-15 minutes. Add additional water or stock if too thick. Season with salt and pepper if needed. 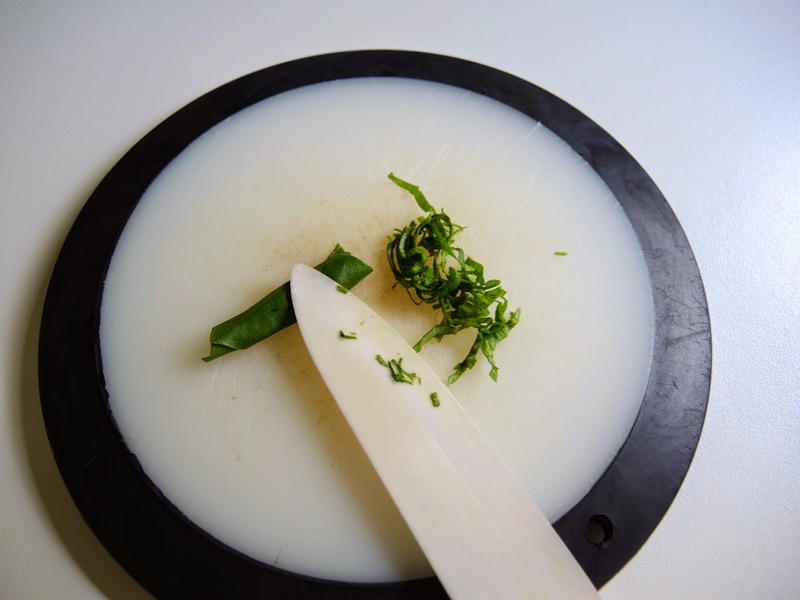 Thinly slice rolled up basil leaves into chiffonade. Ladle soup into bowls. Garnish with reserved roasted onion, basil, and basil balsamic drizzle. Serves 4. The recipe can be doubled or tripled. 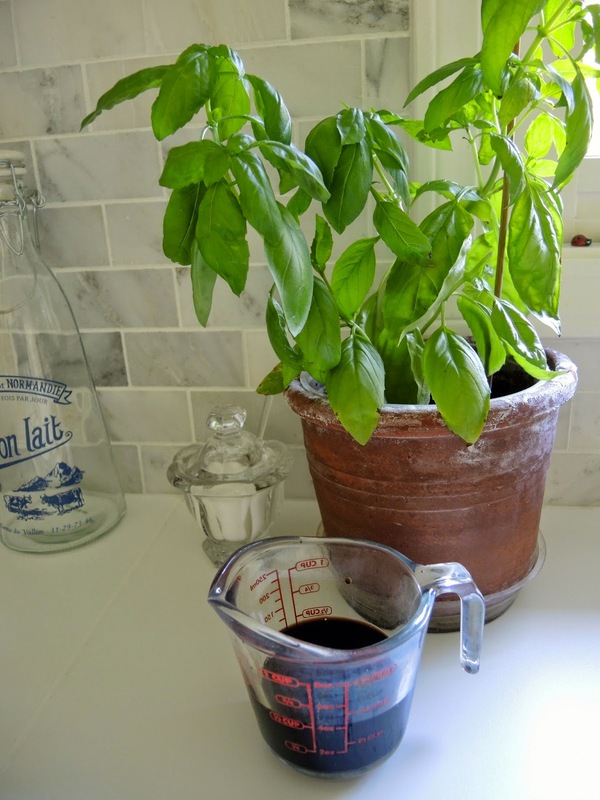 In a small sauce pan combine balsamic vinegar and basil leaves. Simmer over medium heat until reduced to a third of the original amount. It will be slightly thick and syrupy. It will get much thicker after it has been refrigerated. Store in a glass jar in the refrigerator. Thinly slice basil into chiffonade to garnish soup. 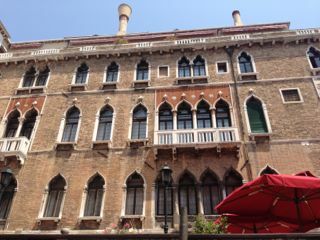 When I was young I read a lot of books about Venice. The idea of a city floating on water fascinated me. 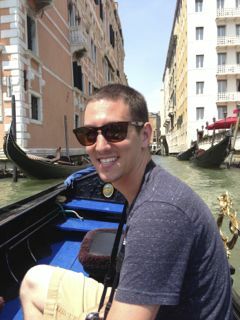 I love water and boats. They have such a soothing affect. 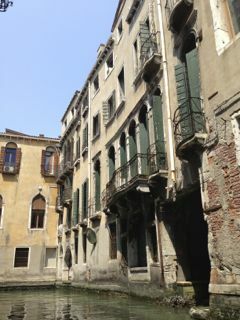 I was also intrigued by the maze of winding streets. 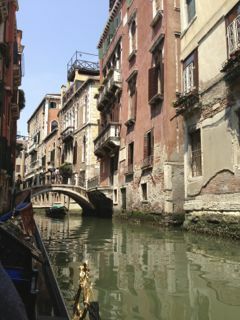 I would daydream about the adventures that were waiting in Venice. 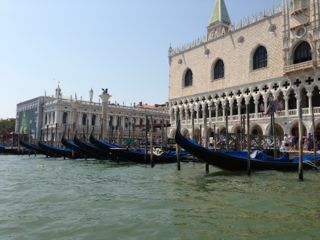 The first time I took Maddie and Addison to Europe we did not visit Venice. We almost did, however by accident, when I took a wrong exit while driving from Rome to Tuscany. 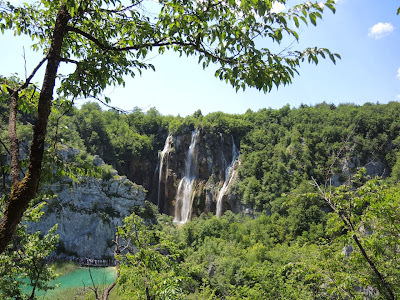 By the time I realized my mistake we were nearly there, but our itinerary made us turn around. So close and yet... 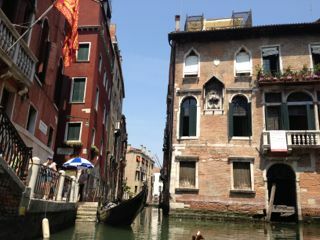 This time as we zig-zagged our way through Central Europe I knew a visit to the floating city was a must. Even if it was only going to be brief. 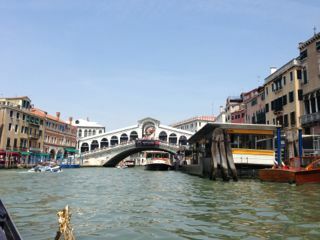 I have only been to Venice once when I was an exchange student in college. 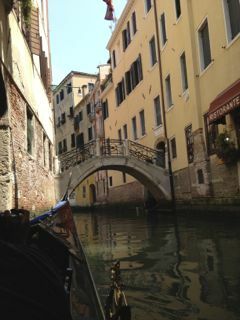 It rained and was grey during our trip, but we had Venice to ourselves. This time it was sunny, hot, and full of people. 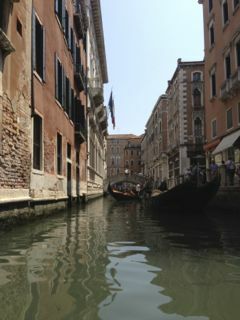 To be true tourists, and escape the crowds a little, we took a gondola ride. As cliché as it may seem, it turned out to be one of the highlights of our trip. 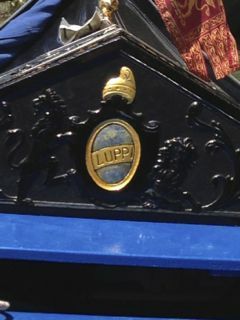 As our gondola, Luppi, quietly navigated the waterways I found myself envious of this beautiful boat. 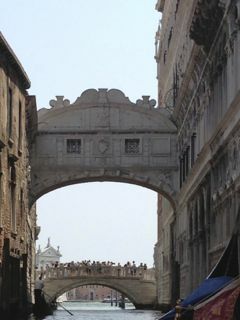 Every day it got to see the charming bridges and beautiful architecture of this amazing city that has existed for hundreds of years. I wished time would stand still so the ride would not end. 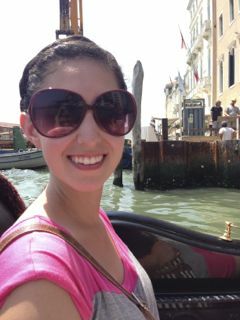 The gondola ride was both exhilarating and relaxing at the same time. 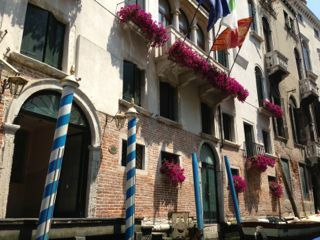 I long to go back to Venice, get lost in the winding streets, and find Luppi again.